Want to stay up to date on the latest happenings of your favorite furry mafia family? Well you’re in luck! 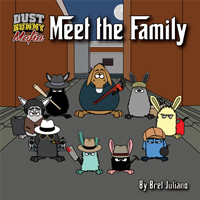 I’ve recently launched the official Dust Bunny Mafia newsletter! It’s filled with great information, comic news and updates that you’ll see before anyone else (other than the other subscribers). I chose the once a month basis as to not bombard your email inboxes with too much spam. *Results may vary depending on how quickly you type.